A 27 yo female patient with giddiness. 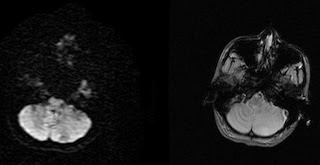 MRI brain with contrast shows an avid discoid enhancing intra axial left cerebellar tumor nodule with marked peri lesional odema. No cystic or necrotic component. An adjacent tortuous vessel noted implying its vascular supply. No bleed or calcification. No restricted diffusion on Dw images. Gross appearance : soft to friable dull gray tan tissue, cut section was dark browh with hemorrhagic appearance. Microscopy: modedrately vascular neoplasm, partially surrounded by pilocystic gliosis. Neoplasm consist of both cellular and reticular areas comprising of numerus proliferating vascular channels of varying caliber, majority of them being congested with few appearing ecstatic. The interstitium shows scattered round to oval cells having modestly hyper chromatin nuclei with coarse chromatin and abundant eosinophilic to vacuolated cytoplasm. These cells have indistinct cytoplasmic margins. No atypical mitosis nor tumor necrosis seen. Cerebellar hemangioblastoma is a benign neoplasm of uncertain origin that comprises approximately 7% of posterior fossa tumors in adults. It is the most common primary intra axial neoplasm of the adult posterior fossa. The association between hemangioblastoma and von Hippel-Lindau syndrome has been well documented, ranged from 35% to 60% in the literature. Age, peaks in incidence during the fifth and sixth decades, except in von Hippel-Lindau syndrome, in which they present in younger adults. Location, the cerebellum is most frequent site, but can also be found in medulla or within the spinal cord, particularly in von Hippel-Lindau syndrome. Supratentorial hemangioblastoma is exceptionally rare. Usually solitary lesions; multiplicity is said to occur in 20% of von Hippel-Lindau syndrome and only rarely in otherwise healthy patients. Multiple hemangioblastomas are more common in spinal cord. Gross pathologic examination of hemangioblastomas reveals well-demarcated, frequently cystic masses with highly vascularized solid nodules within the wall of the cyst. Aside from the mural nodule, the cyst wall is not involved with tumor but is more often simply gliotic. Microscopically, the tumor is neither encapsulated nor well circumscribed, and it can invade cerebellar parenchyma. Intratumoral hemorrhage can occur occasionally in association with hemangioblastoma. The mural nodule is a hypervascular mass of capillaries with intervening benign-appearing neoplastic stroma. Surgical resection is considered curative, but recurrence is common after incomplete excision. In fact, after complete surgical excision, recurrent lesions may actually represent new lesions in von Hippel-Lindau syndrome. MR imaging is the most effective noninvasive imaging modality. There are several characteristic findings on MR imaging that, when found in conjunction with each other, are virtually pathognomonic for this lesion and should be sought by the neuroradiologist in the presence of any intra axial posterior fossa mass in an adult. The most important of these include the following: (a) the cystic nature of the mass, (b) a peripheral pial-based mural nodule of solid tissue that enhances markedly with intravenous contrast, and (c) large vessels within and/or at the periphery of the mass. Approximately two thirds of cerebellar hemangioblastomas are at least partially cystic. Hemangioblastoma cysts are sharply marginated and have smooth borders, signal intensity of tumor cysts is somewhat variable. Entirely solid hemangioblastomas occur in 30% to 40% of cases and are the most common morphologic type if in the supratentorial compartment. The mural nodule or solid portion of the tumor is usually only slightly hyperintense or isointense to gray matter on T2-weighted images and always densely enhances with intravenous contrast and should abut the pia. Although not typical, the cyst wall may also enhance, despite being nonneoplastic. The third feature of hemangioblastomas is the presence of large associated vessels. Tumor vessels are depicted as serpentine or linear regions of signal void on spin echo images. In patients with von Hippel-Lindau disease, the presence of multiple enhancing lesions of varying sizes in the cerebellum is pathognomonic for hemangioblastomas.